Formed from a single ring of LEDs rotating 15 times a second, Globe is a spherical display of over 491,000 pixels that can be viewed from all angles. This is all possible due the persistence of vision effect which causes anything we observe to remain in our vision for approximately 1/15th of a second, the very same effect that allows you to draw in the air with a sparkler. With a Raspberry Pi at its heart, Globe is capable of displaying images, video, games or anything else you could put on a traditional monitor. Globe will ship with an easy to use web interface as well as Android and IOS apps to allow straight forward control over your content. As a piece that draws the eye, Globe is perfect for artistic displays, as a platform for advertising or simply as a cool gadget. Globe has its origins back in 2012 as my final year undergraduate project. Inspired by the work of James Sears I set out to develop a persistence of vision display of my own. Armed with a tiny budget, a 6 month time limit and an overly optimistic work plan I embarked on creating PoV MK1. I started my PhD in 2013 which shifted towards being pretty coding oriented early on. This left me with a need for a practical side project so I began work on a whole new persistence of vision display, from which Globe was born. Over the past 4 years Globe has been redesigned from the ground up, incorporating new technology to allow it to far exceed the limitations of the previous version. Gone are the days of clunky old microcontrollers, now is the time of the super sleek FPGA. Towards the end of 2015 the project started to shift from being purely personal to potentially commercial. Kickstarter presented the ideal platform on which to float Globe, without any large investment required or calamitous risk if unsuccessful. Over the past 2 years I have been slowly preparing for the commercial launch. It has been a time fraught with delay after delay as I tried to balance my research workload with that of Globe (usually unsuccessfully) but at long last it is finally complete. Globe was successfully funded on Kickstarter in November 2017, achieving just over £21,000 worth of funding with 34 full backers. Because of the persistence of vision effect of our vision anything which comes into our vision remains there for about 1/10th to 1/15th of a second. It is this effect that allows us write words with sparklers in the air, perform the “bendy pencil” trick and allowed CRT TVs and monitors to function. Globe, like other persistence of vision displays utilises this effect, allowing images to be displayed without keeping the display hardware permanently in place. By sweeping an array of LEDs repeatedly through a users vision 15 times a second, and altering the colour/brightness of these LEDs it is possible to create the illusion of a much larger display. The shape of the resulting display depends on the shape of the array and direction it is spun. 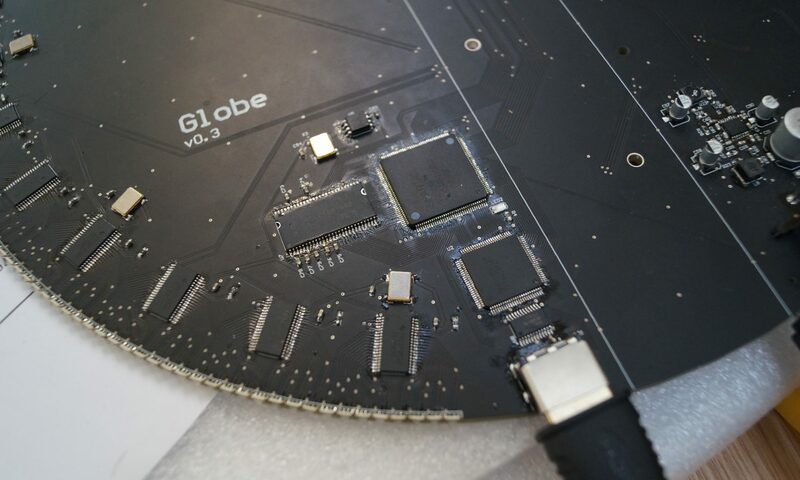 In Globes’ case the array is a circular disk with 240 (the final version will have just over 256) LEDs around the edge which is then spun about the Z axis. By changing the colour of each LED 1920 times every rotation, and rotating 15 times a second we can create a spherical display of 491,000 pixels. By doing a bit of processing with the electronics in the middle we are able to display any content of our choosing. With a Raspberry Pi used to generate the image data, an FPGA then buffers each image and distributes it to the appropriate LED driver. For the in depth explanation as to how Globe works head on over to the blog. Tony Brazier, David O’Connel & Simon Jakes – Masters of the workshop who have entertained this project from its conception, providing endless assistance and advice along the way. Winston Waller – My third year project supervisor, without whose encouragement and expertise the precursor to Globe would never have existed. Xplanet – Xplanet is a great piece of software, capable of simulating and displaying various solar bodies and was used for the generation of all of planetary content for Globe. Mike Field (aka Hamster) – For the creation of the EDID and SDRAM controller VHDL modules used by Globe.